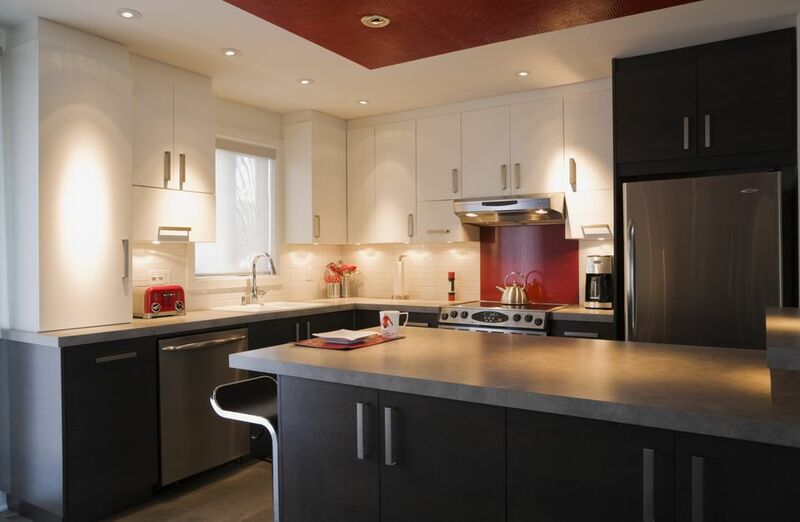 Some types of kitchen ceiling light fixtures are good for general lighting, and others are good for work lighting, but none does both very well. This means that you often have to use different types of lighting to brighten both the general area and your work zones. The classic solution to the kitchen lighting problem is recessed lighting. These are sometimes called can lights. With popular diameters of 4, 5, and 6 inches, recessed lights provide more than enough illumination to certain required areas of the countertop or kitchen island. But one problem with recessed lighting is shadowing. Recessed lights point down, and anything in the path of their light, be it a wall cabinet or a person working at the counter, creates a shadow below the obstruction. The main advantage of recessed lights is that they're flush to the ceiling and don't occupy physical or visual space. However, this creates a drawback: there is no light that is cast onto the ceiling, which helps brighten the space. Older recessed light fixtures also were notorious energy-wasters because they let room heat escape into the attic, but today's AT (airtight) and IC (can be covered with insulation) fixtures don't come with the same energy penalties. Track lighting provides good lighting for the kitchen and has risen in popularity in the last several decades. Track lighting has many of the same good qualities of recessed lighting, with few of recessed lighting's flaws. Track lighting is installed on the surface of the ceiling, and individual light fixtures along the track can be moved easily wherever needed. Also, these individual fixtures can be added or removed if you need more or less light. Track lights have much of the same shadowing problem as recessed lights. But because track lights can be moved, it is possible to move a light either forward or backward to minimize shadowing. One thing to watch out for is "low-voltage" track lighting that uses harsh, energy-wasting halogen bulbs. Track fixtures that use energy-efficient LED bulbs use much less energy, produce less heat, and (like halogens) can be small and still produce a lot of light. Flush-mount ceiling fixtures are solid performers for general illumination. The best types shine light in all directions, including up toward the ceiling. Flush-mount ceiling fixtures are great when you first enter a room. You flip the switch and suddenly you can see where you're walking. On the other hand, they don't do much to illuminate the counter spaces. They also don't offer focused or adjustable light, like track fixtures do. One answer to the quandary of kitchen ceiling lighting is to install hanging pendant light fixtures. Hanging pendants bring the lights down to just above head level and are often vertically adjustable. Hanging pendants can be fixed in place or can be inserted into track lighting tracks. One bit of advice regarding kitchen pendant lights: go sparingly on them. Recessed lights can be multiplied almost endlessly because they are mounted flush with the ceiling and are not very noticeable. However, because pendant lights are hanging down, adding more than three or four begins to make the kitchen look cluttered. But if your pendant lights are spaced out intelligently, they will adequately illuminate most work surfaces. The one areas they can't reach are counter spaces under wall cabinets. No matter what type of ceiling fixtures you use, you'll probably need some task lighting that shines directly down from the wall cabinets. This is the best task lighting because there's nothing to create shadows, and the light can be very bright and focused without casting harsh light into the main kitchen area. Undercabinet fixtures are sleek and essentially invisible once they are installed. Choose LED fixtures for the best lighting performance and energy-efficiency.